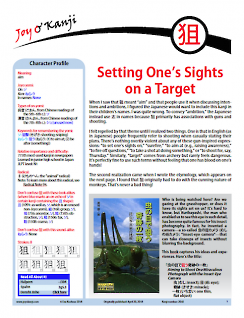 Whether you want to talk about aiming a camera or aiming a golf shot, this kanji is for you. It literally has to do with guns but figuratively offers much more, appearing for instance in terms for intentions and hidden agendas. Through 狙, find out what made a female Soviet teenager famous in World War II, and learn who may have conspired to take down a recent U.S. president.